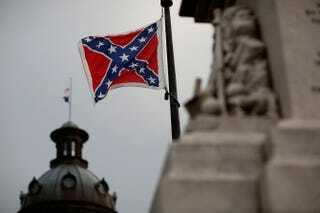 The Confederate flag flies on the Statehouse grounds in Columbia, S.C., June 23, 2015, one day after South Carolina Gov. Nikki Haley announced that she will call for the flag to be removed. Tuesday’s vote was essentially a vote of formality, a required one that will, one way or another, bring to an end the debate surrounding the Confederate battle flag flying on South Carolina’s Statehouse grounds in Columbia. State senators voted 36-3 on Tuesday to remove the flag from its position on Statehouse grounds and move it to the Confederate Relic Room and Military Museum in Columbia. The House is expected to take up the bill for consideration at this point, maybe as early as Wednesday, NPR reports. Just Monday, senators had voted 37-3 to advance the bill to remove the flag altogether, pushing aside other alternatives, such as flying a different Confederate flag or raising the battle flag only on Confederate Memorial Day. According to NPR, the widow of the Rev. Clementa Pinckney, the state senator who lost his life in the massacre at Emanuel African Methodist Episcopal Church in Charleston, S.C., was present for Tuesday’s vote. The pastor’s death, along with those of eight of his congregants—all of them shot to death allegedly by Dylann Roof—has sparked a national debate surrounding the battle flag, which retains a certain prominence in the South.